OK first things first YES this shirt is available for nerdy boys as well. This t-shirt is great for boys and girls who want the world to know that they know about those things called computers. 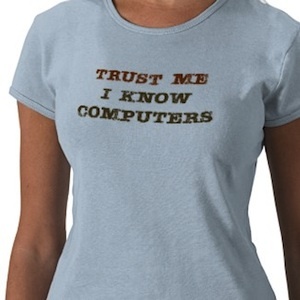 What it says on this t-shirt is “Trust Me I Know Computers” and if you want to find a nice nerd to hook up with then this could be the shirt that makes him / her look. Go get your Trust Me I Know Computers T-Shirt.